In the pursuit of optimal assay performance, our Bioline Custom Solutions group follows two alternative, but often complementary development paths, namely our fast and standard development tracks. Typically, if a development project is considered multi‑variant (e.g. one‑step RT‑qPCR), our R&D team follows our fast‑development track, which applies leading‑edge Design of Experiments (DoE) methodology. DoE is a well‑established and proven statistical method that can be applied to assay development. DoE is defined as a systematic method to determine the relationship between factors affecting a process and the output of that process. The use of DoE in assay development often speeds up assay optimization and facilitates a more thorough evaluation of assay variables. Typically there are several levels of design which can be applied. The simplest level of investigation includes experiments to identify which determinants, including components (e.g. master mix composition) and experimental conditions (e.g. 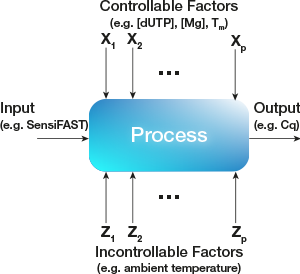 thermal cycling conditions), are most critical to assay performance. This is followed by more thorough analyses that enable identification of significant correlations between performance determinants. The more complex final stage facilitates finer optimization of these factors and improvement of assay robustness. Our fast‑track process applies DoE methodology to predict the best combination of multiple assay variables. Our standard track process is applied either when a development project is considered to be single variant (e.g. normalization of gene expression analysis), or when we are verifying the performance of an assay formulation predicted by our fast‑track process. Click here if you would like to discuss our assay design methodology, or any other needs you may have, with one of our experts. Download a short summary of our fast and standard assay development tracks.